More often than not you will see a TV on my truck because TV removal is such a popular removal request. Now-a-day’s everyone is getting rid of the big tube TV’s because the newer wide screens are so affordable. The only problem is the big Sony’s weigh 180 lbs or more and the are also too big to put in your Prius. 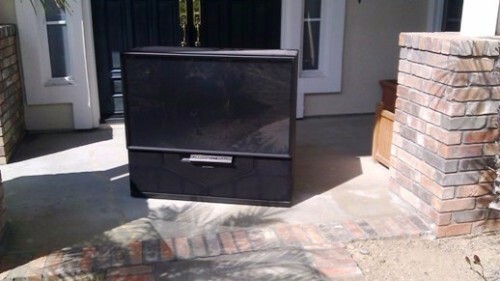 We collect TV’s from our customers and deliver them to certified e-waste recycling businesses in San Diego. In most cases we can remove your TV with a same day - next day appointment.